Inmates at Rikers Island were captured on video trashing their cells and taunting guards in a recent rampage, causing thousands of dollars in damage and leaving correction officers fearful of getting hurt and cautious about intervening at all. The video, obtained exclusively by the I-Team, shows the inmates, who are alleged gang members, on a wrecking mission in their cells a few weeks ago, tearing up virtually everything they could get their hands on. A veteran officer in the Department of Corrections' elite Emergency Services Unit, whose job is to respond to emergencies at Rikers, spoke to the I-Team. He said they're increasingly being assigned to posts to guard gang members. "There was glass, they were pulling the bedframe up, they were ripping the cameras up from inside the cells, they broke the windows," said the officer, who asked to remain anonymous. "In one instance, they threw papers and started a fire." Several officers involved in the incident said that the so-called high-classification inmates should never have been housed in the West facility, originally designed for inmates with communicable diseases. "High-classification inmates like those are supposed to be in a concrete cell with a steel toilet and a steel sink," said the ESU officer. "These are the most notorious criminals in the department. They are the ones that slash other inmates. They are the ones that assault staff the most." The inmates caused thousands of dollars worth of damage in the rampage, according to an incident report. Officers were hesitant to stop it. "If we go in, those inmates who are destroying the cells are going to use those objects against us," said the ESU officer. "Then we get to protect ourselves against those objects. 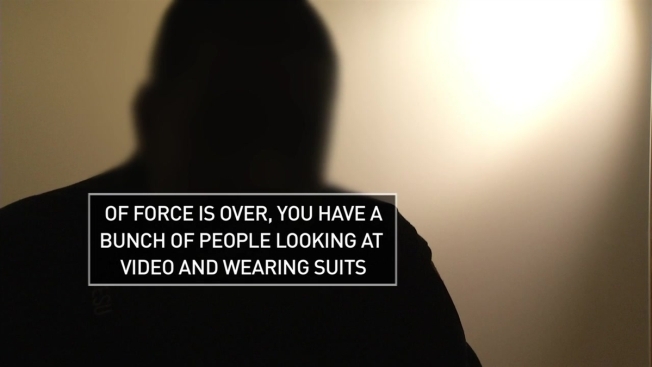 After the use of force is over, you have a bunch of people looking at video and wearing suits that come in Monday-morning quarterback and somehow find fault most of the time against correction officers." The officers say they're understaffed and undersupported by management, and constantly second-guessed. "If we go in, the first use of force, we're scrutinized. We can be prosecuted," said the officer. The officers say the suspected gang members involved in the rampage were moved out of the West facility, but not isolated or punished. On Monday, some of them hurled feces and urined through the bars at several officers. The I-Team was at Booth Memorial Hospital when eight members of the ESU got checked out for exposure. Those ESU officers did not want to show their faces, but they said they're not protected by the Department of Corrections. "We've forced our opinions on our supervisors and managers, and they've done nothing to make changes," said one officer. "We're threatened 24/7," said another. "It seems like all their concern is for the inmates. They're not concerned with protecting the staff," said an officer. The veteran ESU officer told the I-Team: "I would sum it up by saying the Department of Corrections needs to take drastic action to change the way ESU is able to respond to incidents, or I can only imagine the catastrophic failure that is on the horizon for correction officers." A spokesperson for DOC says the department has no comment on inmates' housing, no comment on internal discipline and no comment on officers' assignments. The department does say it is investigating the incidents exposed by the I-Team and that the commissioner has zero tolerance for assaults on officers.